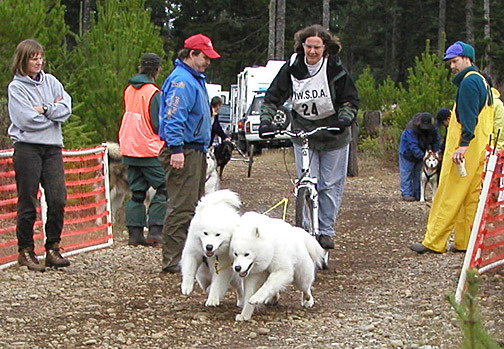 The dog on the right is Ch Wolf River's Thunder Cloud WSX CGC (Nimbus) shown here teamed with Lightning at the start of the 2002 Club Mud Race. He is a tough worker who earned his WSX (Working Samoyed Excellent) title at 1.5 years of age. Together with his best friend Lightning, Nimbus was the 1st Place ISDRA Champion in the 2-Dog Gig Class for the 2002-2003 and 2003-2004 seasons! First time in breed history that an all-Samoyed team has won an ISDRA class!